If you’ve been near Hobsonville Point recently you’ll have seen it’s going off and is currently a hive of building activity. There was some very positive news this week about that would now be developed with twice as many homes as originally intended, especially some of the reasons as to why this has happened, which I’ve emphasised below. 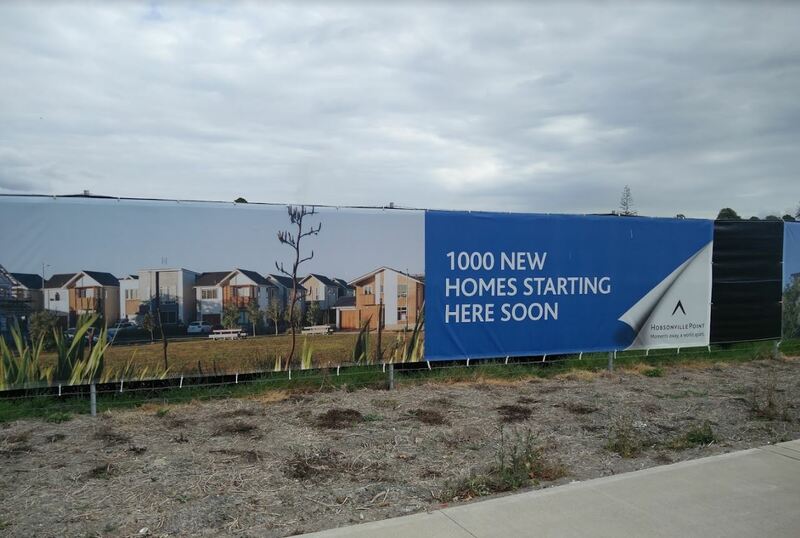 The scale of one of Auckland’s newest big housing developments has now doubled, with Hobsonville Point dwelling dwelling numbers now rising from 2500 to 5000. Demand for residences at the housing estate in Auckland’s northwest has been so strong that the numbers planned to be built there have been up-scaled. Chris Aiken, Hobsonville Land Company chief executive, said instead of 2500 dwellings, around 5000 residences would now be built. More land on the Waitemata Harbour had become available, the area had been prepared for greater density and demand was so strong that it was not only appropriate but also possible to vastly upscale numbers, Aiken indicated. “Building 2500 [dwellings] was first planned about 10 years ago and there was a view of the market – Waitakere City Council and the Government said ‘we will allow for more density’ and they put in place ferry services, roads and employment zones and the market was there. The market came screaming along five years ago,” he said. “The doubling is driven by market demand for smaller product and the capability of the master planning and infrastructure to deal with it. It was a visionary, enabling master plan,” Aiken said. Decisions about rising numbers had been taken over a number of years, due to a combination of factors, he explained. It’s not the first and definitely won’t be the last but Hobsonville Point is a great example that many Aucklanders are quite happy to buy different types of homes, especially if they’re built and designed well. The old myth that “everyone wants a stand alone house and big section” is once again shown to be completely false. Another big source of housing is new land that was planned to become a marine industry and then a film studio but for which neither eventuated. However, an extra 1000 dwellings were added to the plans when a further 20ha became available due to a bureaucratic back-peddling. After being lobbied heavily by the marine industry, a large slice of 20ha was ear-marked for those services, which failed to arrive. That land is now re-zoned for housing, which further contributed to the increasing dwelling numbers, Aiken said. “Land which Auckland Council ear-marked for the boating industry – now we can built on it,” Aiken said. Across most of the site, more apartments and terraced-housing would replace original plans for stand-alone housing. This land is shown below along with the high level plan for how it will be developed. With more houses going in, Auckland Transport are going to need to do a lot better with providing alternative options for transport in and out of the area. The ferry to the city is a good start but only runs a couple of times at the peaks on a weekday so is completely useless for anyone not working very specific hours. As an alternative, as currently planned in the new network, the main bus route through the area will link up Hobsonville Point with Westgate and Constellation Dr Busway station at which people could transfer for a bus to the city but the route is only planned to run every half hour. Further either direction is likely to have locations where the bus is subject to congestion until other projects built, such as the Northwest busway. They need to be starting on the public transport infrastructure for the area now, before even the first sod of ground is turned. No point scratching their heads and moaning about the north-western motorway being even more clogged – if that is possible – once the extra houses are built. Busways have to be added to the motorway now even if it means keeping cars off the new and shining third lane until a dedicated busway is built. Interesting stuff. I was at Hobsonville Point recently and noticed partial demolition on one of the old RNZAF hangars (Wasp I think) – is that linked to residential development I wonder, or was it already being refurbished for industry use? They’d make spectacular apartments or units. Probably heinously expensive though, more’s the pity. I recall from a site visit there were asbestos issues with at least some of the old hangar buildings. 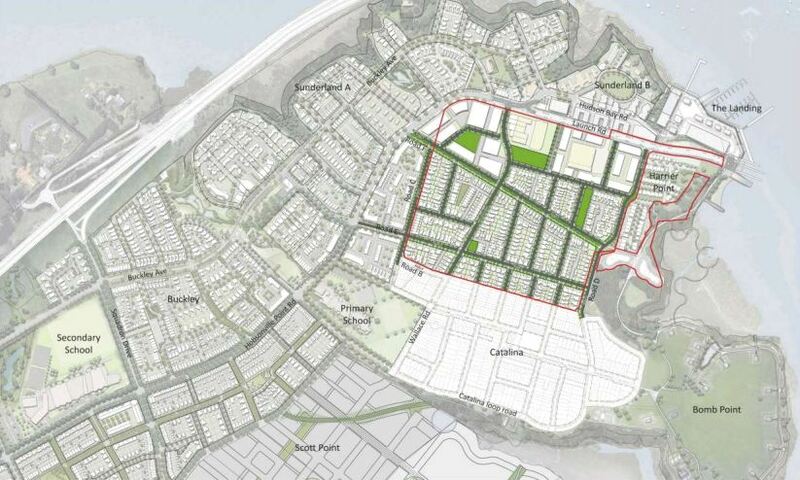 Hobsonville is an example of what can be achieved, when we let people build in suburbs. Suburbanites merge into and expand the existing public transport networks, so have ability to choose greater intensity. If a city has good public transport new suburbs can be built to take advantage of the network. You can compare the medium intensity suburb of Hobsonville with the low intensity exurb of Kumeu 5 km further out. Kumeu cannot access Auckland public transport on its own and therefore people need car centric transportation. The Auckland City PAUP is to restrict suburban and expand exurban development, we are going to build a lot of sprawl – where a lot of sprawl is unneeded. If the RUB were to be eliminated we would see many more medium intensity suburbs and the need to finance low intensity exurbia would vanish. Sprawl would be less, money would be saved, pollution cut and the rate of construction would increase. Kumeu could easily have frequent buses if prize chump Brownlee hadn’t removed the NW busway from plans. Well, from their website I gather that there’s a few affordable homes, ranging from $400,000 to $550,000, to prospective buyers selected by a ballot. I find the idea of selling a few homes below market price to a few lucky ducks selected by a lottery a bit silly, but it’s better than nothing. And the houses have only one storey. Given land prices I find that surprising, wouldn’t it be more advantageous to have a smaller lot and build two storeys? Or is that second storey that expensive? Back to the future. When John Key came to power Hobsonville was slated to include a mix of housing types, including genuinely low income properties. One of his first acts was to axe the low income housing and significantly reduce the numbers. So the recent doubling of the numbers takes us back to fairly close to where we started. I do not have the exact numbers to hand but it would be interesting to compare the new plans with what was proposed a decade ago rather than with earlier this year. The issue is that few people living in Hobsonville care to much about a NW Busway. The main reason is that they IF they use PT commute through Constellation Drive and use the Northern Busway. IF the NW busway is built and it offers a much quicker commute this will of course change but there is little pointing in that direction at present. What Hobsonville needs today is good frequent feeder services (that doesn’t get stuck in traffic) to Constellation Station where there already is a functioning transport centre that provide access to the city at reasonable timings. That should be cheap and easy to fix and not require a 4 years negotiation between AT and NZTA. Instead they plan to complete the SH16 so ensure that buses are catered for here. It will provide a faster/cheaper result. It should be noted that most families residing in West Harbour or Hobsonville choose to send their kids to schools on the shore. The alternative (before the present Hobsonville school was built) was Massey and well lets just say that few parents encouraged their children to attend Massey or for that sake venture Westwards at all. Instead West Harbour and nowadays also Hobsonville is served by schoolbuses from no less than 6 different North Shore schools, daily. The buses are filled to capacity and so is the 7.30-8.30 morning 130 services that snails its way towards Takapuna (despite Westlake Girls offering their own service to/from West Harbour, demand is to great and the 130 is also filled with students). In short, West Harbour and Hobsonville is looking towards the shore at present not just for commuting but also for schooling, for shopping and for work. This may change over time but at present Upper Harbour is more of an extension of Greenhithe than West Auckland. Unfortunately this is also noticed by those that look at buying property in the area. “Affordable” well I am not sure I think West Harbour or Hobsonville falls in those categories and hmm I reside here. BUT Hobsonville Pt it is a great development that offer a lot of learning for the future. However there are heaps of mistakes as well. 1. Motorway access – What the council haven’t done is build a proper motorway ramp, all cars or for that sake buses, going in the direction towards Westgate from Hobsonville Pt cant enter/exit the motorway using the Squadron drive off ramp. The land between the old main road and the new motorway is meant to be for employment. Why the planners decided that meant sprawling last-century factories like Manukau has, I’ll never understand. They missed a chance to plan some smaller business zones amongst all the housing. Yes, we should keep the blue collars where they belong, clearly. Having to force people to commute from residential areas to business areas as the only option is stupid. Motorways did try to make it the predominant option, but having employment opportunities close to home rather than a long commute away is sensible and should be promoted. No, industries should not be placed next to schools or in the middle of neighbourhoods. Thats New Zealand 1960ies ideas they didnt work. Such beliefs fail to create vibrant cities where people move and commerce takes place. Services takes place next to residential neighbourhoods, industry does not. Hobsonville is rather successfull here, the services provided are already attracting a fair bit of customers. It will expand as more people move to the area. Industry however should not be placed next to residential areas. If nothing else the cost to provide extra infrastructure (schools etc) is too prohibitive to waste some of our best residential land for industry. But for the Holden, lion red, watch rugby and drive to work crowd, suburbs should be like islands where you live, work and eventually die. Vibrant city its not. In Hobsonville, some backwards council members and admin staff got it wrong. First they aligned the neighbourhood to Westgate and second they put industrial land where they should have put housing. Then they caved in to certain business and had all cars drive pass the little shopping centre instead of leading cars away from residential areas using the already constructed squadron offramp. One may also question the analysis behind the choice of industry on perfect residential land. First what jobs/industries that match present competencies of the inhabitants of the area will be created? What industry is suitable to be placed right next to the largest school of the area? People will commute in to the area for work while the local residents continue their commute to mainly the CBD but also towards the shore. Never mind the chronic shortage of housing or the ability to ibcrease scale and thus cost of building etc etc. My humble guess we dont recruit professionals from “best practice” countries instead preferring locals/brits and South Africans. Thats a travesty. From experience this is not the only example of Talent management processes failing and lacking the needed knowledge in regards to infrastructure (and for that sake building regulations) and to be honest whoever the headhunter companies are, they sure lack knowledge and depth. A median bus lane running down the middle of Hobsonville Point Rd would have be nice. When are we likely to see a more comprehensive service, (including a weekend service to access the Farmers Market with bikes as we improve the NW Cycleway loop back into town or around the Upper Harbour to the North Shore? Heaps more undercover bike parking at the terminal at Hobsonville would be good to see as well. 1. The motorway interchanges near Hobsonville were not designed by the plonker council but by the forerunner of NZTA, who stated at the time that their motorway was being built to enable long-distance transport between Northland and the Waikato – not to allow Aucklanders to make short local trips. We had to fight to get any sort of interchange at Squadron Drive at all. 2. Suburbanites did not “choose greater intensity” at Hobsonville because there was good public transport (There wasn’t). Rather the plonker Waitakere City Council chose to have planning rules that allow flexible lot sizes within a minimum overall density, rather than the more usual regime of maximum density and minimum lot sizes, which sees large 4-bedroom houses being built to cater for a population where most households now comprise couples or singles. Are there are more sites in Auckland to be developed in this manner? Medium density, master planned by a social corporation? Can I just take a moment to say… “YESSSSSS!” ? Agree this is absolutely no place for such and internally focussed structure; better as housing, and will help HP get a critical mass of residents to develop local economy down on the wharf, which is necessary, in my view, to really build a place and community here… it is blessed with the eccentric set of old buildings and harbourside setting. Now to make that ferry more useful and financially viable.